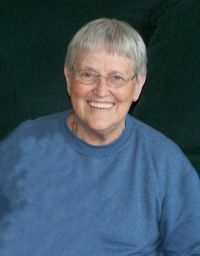 Peacefully on January 2, 2012 at the Boyne Lodge in Carman, Marie went home to be with her Lord and Saviour. She will be dearly missed and remembered by her husband Bill, her sons Doug and David, daughter in law Naomi and grandchildren Keegan, Ethan and Calista. She was predeceased by her parents Germaine and France(Gauthier) Martin, her brothers John, Peter, Simon, her sisters Germaine, Yvonne, Jacqueline and her husband Leonard Hartog, of Winnipeg and two infant sisters and niece, Darlene Hartog of Hodgson, MB. She is survived by her sisters Suzanne, Louise and Denise, Sister-in-laws Vi and Katie, numerous nieces, nephews, great nieces and nephews. Marie was born and raised in the Fisher Branch/Hodgson, MB, going to school in a one room schoolhouse. As a young woman she began working in Winnipeg where Marie and Bill found each other and began their family. Marie loved her grandchildren very much. They were the joy of her life, spending time on the floor with them, playing and having fun with them. Marie also enjoyed the outdoors, like gardening, all the camping trips and holidays that we took with family and friends. Special thanks for the excellent and loving care that she received from the staff at the Boyne Lodge in Carman, MB. for her final days here on this earth. WE DO LOVE YOU PEOPLE!!! Funeral service will be held at Carman Pentecostal Church on Saturday the 7th of January, at 11:00 AM. In lieu of flowers donations can be made to the Alzheimer Society of Manitoba or to the Boyne Lodge. We truly LOVE and Miss You!! !